Minutes ago, Bob Chapek, Chairman of Disney Parks, Experiences and Consumer Products, announced that Disney Skyliner will be ready to begin transporting guests at the Walt Disney World Resort beginning fall of 2019! 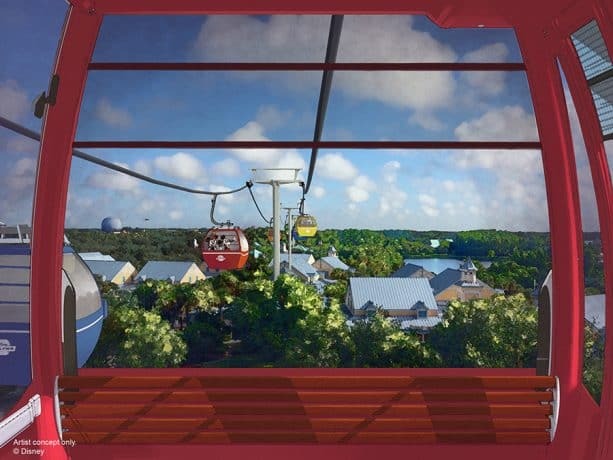 As many of you know, this new state-of-the-art gondola system will conveniently connect Disney’s Hollywood Studios and Epcot to four resort hotels- Disney’s Art of Animation Resort, Disney’s Pop Century Resort and Disney’s Caribbean Beach Resort as well as the proposed 15th Disney Vacation Club property, Disney’s Riviera Resort. And next fall, Disney Skyliner will not only efficiently move you to your location, it’ll also offer a whole new way to experience Walt Disney World with amazing views only available from the sky – with great photo opportunities! For example, guests arriving at the International Gateway station will travel through the trees and be welcomed into Epcot with remarkable, never before-seen views across World Showcase. The innovative transportation system is quickly coming to life! Workers just installed the last support tower at the Resort and are beginning to thread the series of reinforced cables to carry guests in stylish themed gondolas. Keep checking the Disney Parks Blog for more exciting details on Disney Skyliner. Do you know if the Skyliner will be up and running in September? How many people will the Skyliner hold? How long between cars. Just trying to understand how much easing of transportation will result. We recently stayed at the OKW and were so very dissappointed in the bus transportation. Planning our next trip and looking at Caribbean or Art of Animation. Has Disney announced whether or not the gondolas will have air conditioning? So this will completely replace bus service to Epcot and Hollywood Studios from the serviced resorts? Wow thanks Kurt for all that information! I was kind of hoping they’d be treated like the monorail! Makes it even more exciting to anticipate trying!!! My understanding is the gondolas are configured similarly to the monorails, seats along front and back, space in the middle for carts and strollers. When loading, the floors match the loading platforms, so no ramps or special handling is needed. They will run continuously during the day, and will be considered in-park transportation, like the boats and buses. There is going to be nearly seven miles of cables, so another year is not that long to wait on such a huge project. I’m honestly a bit confused about this. They’ve already started stringing the cables for the gondolas. Supports are all installed. The stations are nearing completion. It looks like they could have all of the main work done in a month or two, along with testing. So what is happening that it’s going to take a year from now? With the progress they are making and what is done, I’m stumped as to what would keep this from opening in the summer at worst. And really seems like there isn’t much preventing it from being ready sometime in the Spring. I’m just not understanding the timelines and why so long. Is it scooter and wheelchair accessible? Well it is super exciting to imagine riding along such a long gondola ride! I know I am getting into the weeds with my question, but do you how much it will cost or if you are a resort guest will it be included in your resort cost? Also, do you know how long of a ride it will be and will advanced reservations be needed? Just a little excited (and a hint scared lol) to try this on our “off days” when we meander around Walt Disney World and everything else it has to offer. So it looks like the timeline will be for my family to be Spring 2020…unless we manage to sneak in another trip in 2019 🙂 fingers crossed!!! Is there going to be seating or is it standing room only? Will they be scooter and wheel chair accessible? I’m confused how this will take nearly another year to install the cables and test this new form of transportation.